ESO, the world’s most productive ground-based observatory, will open its doors to the public on Saturday 21 October 2017 between 11:00 and 18:00 CEST. 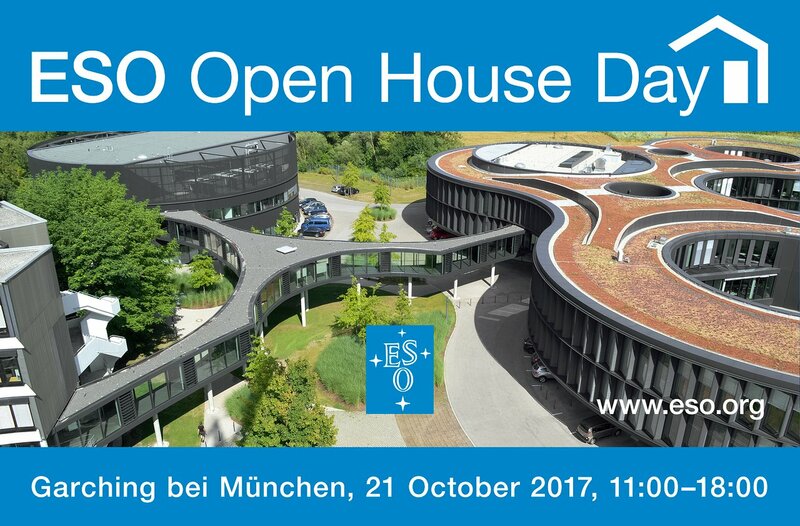 The ESO Open House Day event will be held at ESO’s Headquarters in Garching, near Munich, Germany. Visitors will have the opportunity to experience the world of ESO first hand by taking part in many different activities; the programme of activities for the day is set out below. If you need help to find your way around during the Open House Day, look out for our members of staff, who will be wearing name badges. As ESO is an international organisation, our staff speak several languages between them. Pick up free material about ESO, an event programme and a map of the building. Children can pick up passports in which to collect stamps and they will have a chance to win gifts if they accumulate all of the stamps from our activities (on departure, gifts can be collected from area 16). Children can also pick up an album for stickers here. Find out more about this fascinating technique which is used to compensate for the turbulent atmosphere above us. If we have clear skies, astronomers will show you the Sun with their small specialist solar telescopes. At this spectacular comet making demonstration learn about comets and what they’re made of.